sister projects: Wikipedia article, Commons category, quotes, definition, textbook, course, taxonomy, Wikidata item. 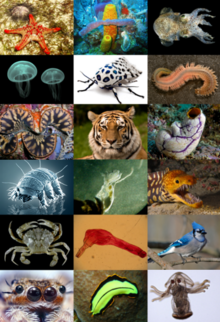 Zoology, occasionally also spelt zoölogy, is the branch of biology which relates to the animal kingdom, including the structure, embryology, evolution, classification, habits, and distribution of all animals, both living and extinct. The term is derived from Ancient Greek ζῷον (zōon, “animal”) + λόγος (logos, “knowledge”).— Excerpted from Zoology on Wikipedia, the free encyclopedia. In biology, morphology is a branch of bioscience dealing with the study of the form and structure of organisms and their specific structural features. This includes aspects of the outward appearance (shape, structure, colour, pattern) as well as the form and structure of the internal parts like bones and organs. This is in contrast to physiology, which deals primarily with function. Morphology is a branch of life science dealing with the study of gross structure of an organism or Taxon and its component parts.— Excerpted from Morphology (biology) on Wikipedia, the free encyclopedia. "Anatomy" is the study of the form and structure of internal features of an organism.— Excerpted from Morphology (biology) on Wikipedia, the free encyclopedia. "Eidonomy" is the study of the form and structure of the external features of an organism.— Excerpted from Morphology (biology) on Wikipedia, the free encyclopedia.